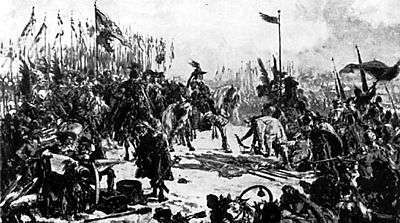 The Smolensk War (1632–1634) was a conflict fought between the Polish-Lithuanian Commonwealth and Russia. Hostilities began in October 1632 when Russian forces tried to capture the city of Smolensk. Small military engagements produced mixed results for both sides, but the surrender of the main Russian force in February 1634 led to the Treaty of Polyanovka. Russia accepted Polish-Lithuanian control over the Smolensk region, which lasted for another 20 years. The Commonwealth was not ready for war. In 1631, the royal army numbered barely 3,000 men; the Smolensk garrison was about 500 strong, and most garrisons in the border area were composed not of regular or mercenary soldiers but of 100 to 200 local volunteers. Aware that Russia was preparing for war, in the spring of 1632 the Sejm (Polish-Lithuanian parliament) increased the army by recruiting an additional 4,500 men; by mid-1632 the deputy voivode (podwojewoda) of Smolensk, Samuel Drucki-Sokoliński, had about 500 volunteers from pospolite ruszenie and 2,500 regular army soldiers and Cossacks. In May the Senate of Poland agreed to increase the size of the army, but Grand Lithuanian Hetman Lew Sapieha objected, arguing that the current forces were enough and that war was not likely. Nonetheless the Field Lithuanian Hetman Krzysztof Radziwiłł recruited an additional 2,000 soldiers. Russia, having recovered to a certain extent from the Time of Troubles, agreed with the assessment that the Commonwealth would be weakened by the death of its king, and unilaterally attacked without waiting for the Swedes and the Ottomans. Russia's aim was to gain control of Smolensk, which it had ceded to the Commonwealth in 1618 at the Truce of Deulino, ending the last Russo-Polish War. Smolensk was the capital of the Commonwealth's Smoleńsk Voivodeship, but it had often been contested, and it changed hands many times during the 15th, 16th and 17th centuries (from the days of the Muscovite-Lithuanian Wars). A major supporter of the war was the Tsar's father, Patriarch Filaret, who represented the anti-Polish camp at court. Inspired by the Zemsky Sobor's (Russian parliament's) call for vengeance and reclamation of lost lands, the Russian army sallied west. By the summer of 1633, the relief force, led personally by the king and numbering about 25,000 (20,000 in the Polish-Lithuanian army, according to Jasienica), arrived near Smolensk; they reached Orsha on 17 August 1633. By the first days of September, the main body of the relief forces approaching Smolensk numbered around 14,000. The Russian army, recently reinforced, numbered 25,000. Only when Cossack reinforcements, led by Tymosz (Timofiy) Orendarenko and numbering between 10,000 and 20,000, arrived on 17 September would the Commonwealth army gain numerical superiority. The Cossacks under Orendarenko and Marcin Kazanowski would raid the Russian rear lines, freeing the Polish-Lithuanian units under Radziwiłł and Gosiewski to join the effort to break the siege. Surrender of Mikhail Shein at Smolensk. Author unknown. Władysław's brother, John II Casimir, commanded one of the regiments in the relief army. Another notable commander was the Field Crown Hetman, Marcin Kazanowski. King Władysław IV, a great supporter of the modernization of the Commonwealth army, proved to be a good tactician, and his innovations in the use of artillery and fortifications based on Western ideas greatly contributed to the eventual Polish-Lithuanian success. He had replaced the old arquebusiers with musketeers, and standardized the Commonwealth artillery (introducing 3- to 6-pounder regimental guns), both to great effect. King Władysław IV on horseback near Smolensk after seizing the Smolensk Fortress. Painting by Jan Matejko, lost during the Second World War. Already during the later stages of the war, when the Commonwealth army moved from Smolensk to Bely, a new threat begun to loom on the southern borders, where the Ottoman Empire was massing an invasion force. Thus Władysław begun redirecting his reinforcements to that theater. Later that year, the Commonwealth forces under Stanisław Koniecpolski scored a victory in the south, ending a war against the Ottomans. Both sides introduced new tactics, units and equipment based on Western models, but the Polish-Lithuanian forces proved more adept with these innovations than the Russians. However, the main factors that kept the Russians from winning were the delay in moving siege artillery to Smolensk and the severe disruption of Russian supply lines by Polish cavalry. A scapegoat was nevertheless needed: Mikhail Shein was accused of treason and, together with his second-in-command Artemy Izmaylov and the latter's son Vasily, executed in Moscow on April 28, 1634. Learning from this defeat, the Russians would adopt new and more successful tactics in the Polish-Russian War (1654-1656). After the war, Władysław gave the Russians the border town of Serpeysk and nearby territories, hoping to persuade the Tsar to join in an anti-Swedish alliance. However, the king was ultimately unable to overcome objections from the Polish-Lithuanian Sejm, who were unwilling to fight Sweden after the Treaty of Sztumska Wieś. The Russians, unable to see benefit in such an alliance, were also unenthusiastic, and the proposed alliance came to nothing. The Battle of Smolensk is commemorated on the Tomb of the Unknown Soldier, Warsaw, with the inscription "SMOLENSK 18 X 1632-25 II 1634". 1 2 3 4 5 6 7 8 9 10 11 12 13 14 15 16 17 Gierowski, Józef Andrzej (1979). Historia Polski, 1505–1764. Państwowe Wydawnictwo Naukowe. pp. 235–236. ISBN 83-01-00172-0. 1 2 Nagielski, Mirosław (2006). Diariusz kampanii smoleńskiej Władysława IV 1633–1634. DiG. p. 7. ISBN 83-7181-410-0. 1 2 3 Nagielski, p. 8–9. 1 2 3 4 5 6 7 8 Rickard, J. (2007-07-26). "Smolensk War, 1632–1634". Retrieved 2007-08-02. 1 2 3 Hellie, Richard (1999). The Economy and Material Culture of Russia, 1600–1725. Chicago: University of Chicago Press. p. 4. ISBN 0-226-32649-7. 1 2 Davies, Norman (1994). God's Playground (Polish ed.). Znak. p. 602. ISBN 83-7006-331-4. 1 2 3 4 5 6 7 8 9 10 11 12 13 14 15 Jasienica, Paweł (1982). Rzeczpospolita Obojga Narodów: Srebny Wiek. Państwowy Instytut Wydawniczy. pp. 370–372. ISBN 83-06-00788-3. 1 2 3 4 5 6 7 8 9 Władysław IV Waza 1595–1658. Władcy Polski Nr 23. Rzeczpospolita and Mówią Wieki. Various authors and editors. 24 July 2007. 1 2 3 4 5 6 7 8 9 10 Black, Jeremy (2002). European Warfare, 1494–1660. London: Routledge. p. 137. ISBN 0-415-27531-8. 1 2 3 Nagielski, p. 12–13. 1 2 Nagielski, p. 11–12. ↑ Bonney, Richard (1999). The Rise of the Fiscal State in Europe, C. 1200–1815. London: Oxford University Press. p. 471. ISBN 0-19-820402-7. 1 2 Nagielski, p. 21. 1 2 Nagielski, p. 26–27. ↑ Parker, Geoffrey (1997). The Thirty Years' War. Routledge. p. 124. ISBN 0-415-12883-8. 1 2 3 4 Nagielski, p. 43–44. 1 2 Czubiński, Antoni; Topolski, Jerzy (1988). Historia Polski. Wydawnictwo Ossolińskich. p. 181. ISBN 83-04-01919-1. 1 2 3 Nagielski, p. 54. 1 2 3 Nagielski, p. 52–53. (Russian) Волков В.А. "Смоленская война (1632–1634 гг.)"